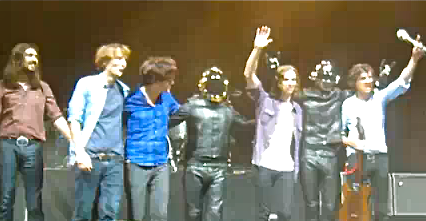 Last night for the finale of the Phoenix concert at Madison Square Garden, the band inconspicuously delivered their last song, 1901 with the equally impressive, but highly elusive band: Daft Punk. The two music groups are friends. Both hail from the same city: Versailles--where both bands, along with Air, gave birth to what was once a mini Versaillian electronic movement that has since exploded into a world-wide phenomenon. 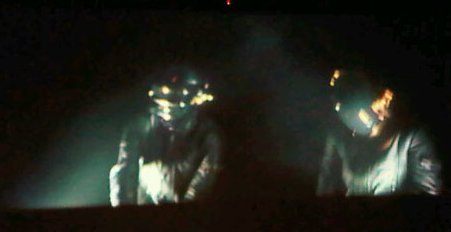 (Video of the surprise Daft Punk appearance with Phoenix after the jump). In fact, Phoenix's guitarist Laurent Brancowitz (the older brother of the band's other guitarist, Chris Mazzalai) used to play in another band called, Darlin (prior to joining Phoenix), which he started with Thomas Bangalter and Guy Manuel de Homem-Chisto, who later formed Daft Punk. And on a side note, Phoenix and Air also do collaborations together from time to time, as in The Virgin Suicide album, (which by the way is how Phoenix's lead singer Thomas Mars met his now long-time partner, Writer/Director Sofia Coppola). Confused yet? Don't worry you'll feel well informed as soon as you've digested all of it. In the mean time, enjoy the video (below), which captures Phoenix and Daft Punk literally having fun with each other--as they deliver the last song of what appeared to be a magical night for everyone.